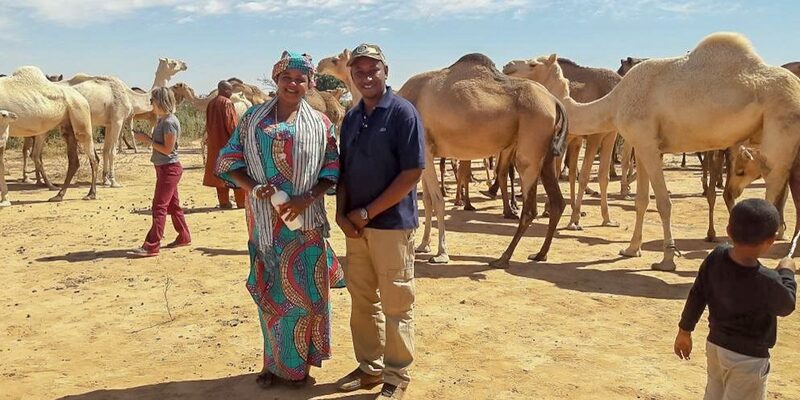 Entrepreneur Wouro Habsatou Aboubacar, who runs a camel ranch outside of Niamey, Niger, is a potential beneficiary of MCC’s $437 million compact to strengthen Niger’s vital agricultural sector. Figures are approximate as of May 2018 and represent funds obligated to MCC programs in development. Growth in agriculture is, on average, at least twice as effective in reducing poverty as growth in other sectors and is known to reduce poverty directly by raising farm incomes, and indirectly by generating employment and reducing food prices. Nonetheless, economic growth and food security objectives can be difficult to achieve for a number of reasons, such as poor roads, drought, low soil quality, inefficient crop watering systems, lack of proper crop storage, unhealthy livestock, lack of access to financing, and an absence of secure land rights. MCC has invested more than $5 billion in partner countries to address the many sources of food insecurity. MCC investments cover a wide range of projects that target transportation and storage infrastructure, irrigation systems, access to finance, farmer training and nutrition and sanitation. MCC has also helped strengthen property rights and improve land policy to ensure that farmers—many of whom are women—have secure access to land, and that government institutions can effectively manage land resources. 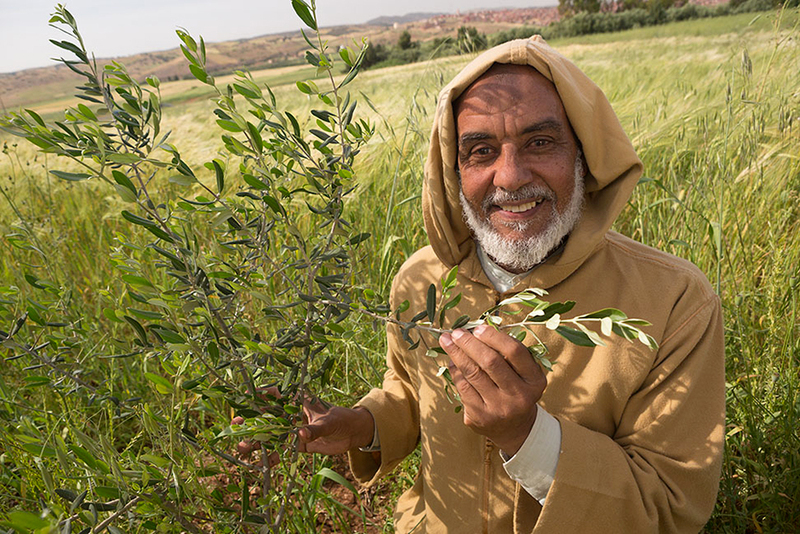 Small-holder farmer Mohamed El Ouafi stands in his wheat and olive sapling field outside Ben Khili, Morocco. Through the Fruit Tree Productivity Project in MCC’s Morocco Compact, he has received new tree saplings and agricultural training. MCC’s agriculture investments give small-holder farmers the knowledge and skills they need to improve their livelihoods and transition from subsistence farming to small-scale commercial farming, so they can produce enough to sell for extra income. Small-holder farmers are the backbone of many rural economies given their role in agriculture and food security. The term small-holder refers to farmers with limited resources at their disposal and smaller plot size relative to others. Small-holder farmers typically work on less than five acres and produce only enough food to feed their families. Women prepare rice for processing at the Centre d’Étuvage de Riz de l’Union Ben-Ka-Di de la Vallée du Sourou (Ben-Ka-Di Union’s Steaming Center in the Sourou Valley) in Niassan village, Burkina Faso. MCC has provided technical training and improved equipment to the women’s group, which produces value-added, parboiled rice. Women make up, on average, 43 percent of the agriculture labor force in developing countries, and 50 percent or more in some parts of Africa, yet they make up less than 20 percent of all land holders and have limited access to seeds, fertilizer, equipment, financing and training. MCC’s programs emphasize gender equality and inclusion in part because, when women’s social and economic status improves, productivity increases and poverty decreases. Strengthening women’s land and property rights empowers women to participate in community organizations and gives them greater influence over household income and expenditures – which typically helps to reduce household poverty and benefit children. Through MCC projects in Senegal and Mali, women, both individually and collectively, were given unprecedented access to newly irrigated agricultural land. 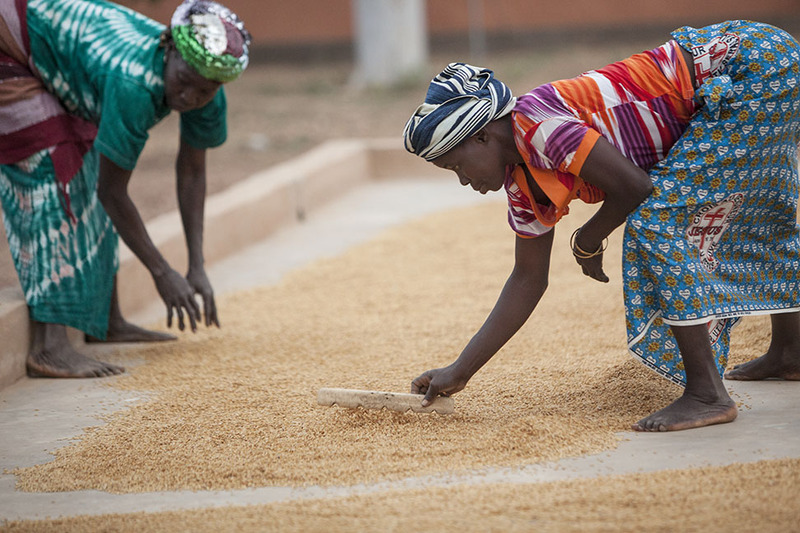 To reduce poverty, women must be empowered to fully participate in agricultural growth. MCC continues to drive innovation across the U.S. government and the development community, particularly through partnerships. MCC supports partnerships with the private sector that leverage funds toward innovative solutions to problems that constrain inclusive economic growth. MCC’s goals, mission and country-driven approach are consistent with Feed the Future and it is proud to be an implementing agency in the U.S. Government-wide initiative to help sustainably reduce hunger and poverty through increased agricultural development and nutrition programs. MCC supported Feed the Future’s development of rigorous analytical tools, including its monitoring and evaluation framework, and continues to share best practices in areas such as irrigation, farmer training and land tenure. MCC also uses tools developed by Feed the Future, including the Women’s Empowerment in Agriculture index—an innovative way to measure how women benefit from agricultural investments. MCC worked with 10 other U.S. Government agencies and departments to develop the U.S. Global Food Security Strategy. The Strategy provides an integrated whole-of-government approach, along with agency-specific implementation plans, as required by the Global Food Security Act of 2016, which President Barack Obama signed into law in July 2016. This bipartisan legislation solidifies the U.S. Government’s commitment to improving agricultural and food systems to increase incomes, strengthen resilience and boost nutrition. Strengthening rural banks and other financial providers to support agriculture and agribusiness is an important step in helping farming communities grow, prosper and compete. MCC works with partner countries to expand access to finance for farmers and agribusinesses by funding agriculture lending programs and providing new technology and credit training to borrowers and lenders. MCC helped Moldovan farmers like Simion and Elena Tertiuc expand their businesses by providing access to finance for agriculture. The Tertiucs built a greenhouse to supplement their small farm with a loan secured thanks to MCC’s compact and planted strawberries and tomatoes. Moldova is a small and densely populated country that is heavily dependent on agriculture. As part of the $262 million Moldova Compact, MCC provided funding for agricultural infrastructure—such as cold storage—that will help high-value crops from Moldovan producers compete in domestic and international markets. The credit program included an innovative equipment leasing activity that supplied long-term financing to farmers so they could invest in on-farm irrigation and other equipment necessary for growing high-value crops. A total of $4.6 million was approved to help give 80 enterprises and farmers the irrigation and farm equipment they needed. High-value agriculture includes fruit, vegetable and nut crops that command higher market prices and generate higher levels of income for farmers than cereal crops like rice, wheat, and millet. Accessing credit is a challenge for those who do not have land or real estate assets that banks often require as collateral. As part of a $215 million compact with Honduras, MCC funded an access to credit program that was made possible after policy reforms, including the passage of the Movable Property Law and the establishment of the National Movable Guarantee Registry, which allows for non-real estate assets, such as farm equipment, to be used as collateral. The Honduras Compact, which aimed to increase agricultural productivity, also provided technical assistance to banks and financial providers as well as seed, fertilizer and other suppliers to extend credit to small- and medium-sized farmers under better terms. Farmers were also provided with business and technical assistance to help them become more commercially oriented. By the compact’s end, loans were given to close to 6,000 farmers, agribusinesses, and other producers and vendors in the horticulture industry. Research, education and training can help farmers apply innovative new systems, improve farm yields and increase their income. Through investments in farmer training programs and technical assistance, MCC works with partner countries to promote growth in agriculture by giving small-holder farmers the knowledge and skills they need to improve their livelihoods. Hajiba is a member of an agricultural cooperative in Ourika, Morocco, which received training and support from MCC. 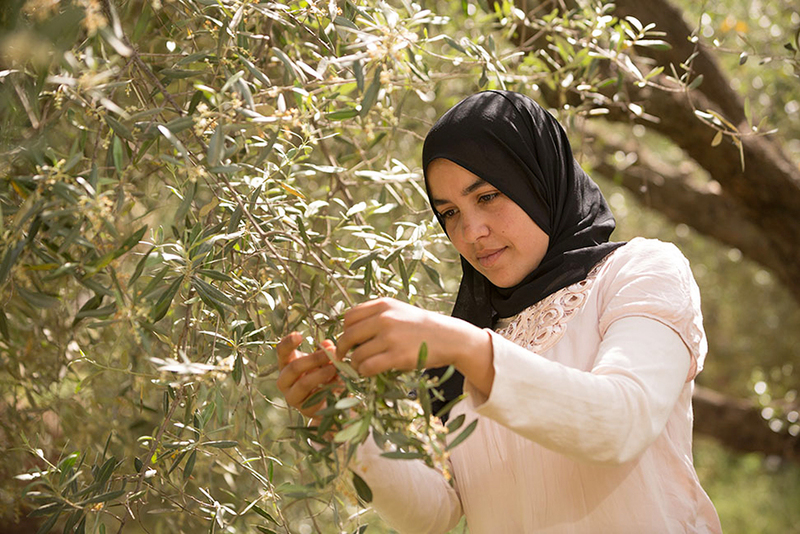 The cooperative provides harvesting and pruning services for small-holder olive farmers in the area. About 70 percent of Morocco’s poor live in rural areas, and the agriculture sector employs about 40 percent of the nation’s workforce, making it the largest employer in the country. But many of the agricultural practices in Morocco have led to severe soil erosion, desertification and water pollution caused by rain washing loose topsoil into reservoirs. To increase and stabilize the income of poor farmers and protect the natural resources, MCC’s $697 million Morocco Compact helped Moroccan farmers diversify to more valuable crops that are less water intensive. The project trained more than 40,000 farmers; rehabilitated about 55,000 hectares of existing, rain-fed fruit tree orchards and 50,000 hectares of existing irrigated orchards; and planted nearly 62,000 hectares of new orchards on land formerly dedicated to wheat production. Land is an essential asset for agricultural income generation and wealth creation. MCC works with partner countries to strengthen property rights, support transparent land allocation processes, and promote the accessibility and accountability of land administration agencies. Approximately half of MCC’s compacts have included investments that contribute to food security by improving access to secure land rights for small- and large-scale producers in MCC partner countries. Women of Namodiral women’s group winnow rice in the Ngalenka perimeter, a new irrigated perimeter in Podor Department, northern Senegal. 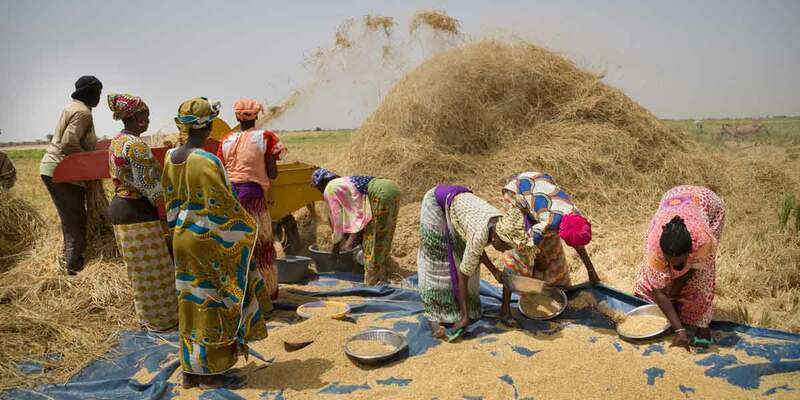 As part of MCC’s Senegal Compact, the women received land rights for the first time. Read their story. In 2009, MCC and Senegal signed a $540 million compact aimed at reducing poverty and increasing economic growth by unlocking the country’s agricultural productivity. Based on national priorities to reduce poverty and improve food security, the Compact worked to extend and improve irrigation in agriculture-dependent areas of the Senegal River Valley. A land tenure activity that accompanied the irrigation investments advanced land tenure security and mitigated the risk of conflict that can arise when land values increase in newly irrigated or improved areas. New land allocation criteria were developed from hands-on community workshops that involved input from stakeholder groups, including farmers, herders, women and youth. The approach blended traditional and modern land practices and included work with the local communities and institutions to improve land governance. The Senegalese Government and other donor groups plan to build on the changes made through MCC’s project by expanding its implementation to several additional farm communities in the Senegal River Valley, ensuring continued progress long after MCC’s compact. A peri-urban cattle herder in Mongolia who was trained in animal care and proper grazing through MCC Mongolia Compact. 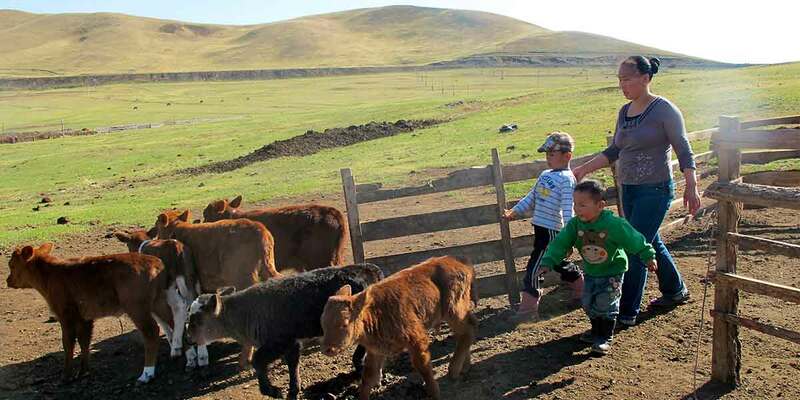 In the 1990s and 2000s, large numbers of Mongolia’s livestock herders abandoned traditional nomadic practices and moved to “peri-urban” areas around Mongolian cities. They brought their animals with them, and the resulting overcrowding and lack of clear land rights led to overgrazing and land deterioration. Through the $269 million MCC Compact with Mongolia, MCC helped the Mongolian Government address this problem by supporting the design and implementation of a land-leasing system for pasture areas in peri-urban regions. The system provided land leases that covered more than 1,300 herder households, drilled 346 wells on leased lands to bring water for livestock and household use, and trained herder groups on sustainable land use and livestock productivity. With an effective land-leasing system, quality infrastructure and training, herders can improve their pasturelands and their livelihoods. Without appropriate water resource management, crops are subject to floods and droughts, creating severe price and yield fluctuations. Training farmers on modern irrigation technology for efficient use of irrigation water also ensures climate resiliency in the event of drought. MCC works with partner countries on policies and practices to better manage water resources used for agricultural production. MCC’s Moldova Compact rehabilitated and modernized irrigation systems, supporting the production of higher value crops. 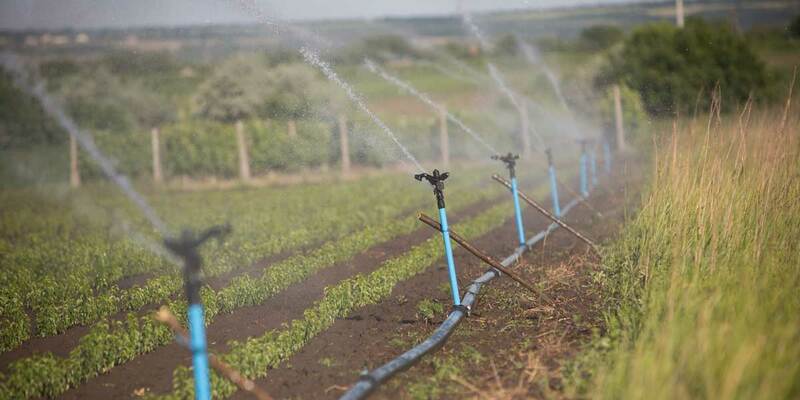 Part of MCC’s $262 million Moldova Compact aimed to revitalize Moldova’s fruit and vegetable agriculture by improving the country’s deteriorating irrigation infrastructure. A $130.3 million agriculture project rehabilitated 10 pumping stations along the country’s two main rivers, the Prut and the Nistru, and improved delivery of water over more than 28,000 acres. The updated irrigation systems included technology that allows for precise monitoring of water usage and eliminates leakages and losses that were common in older systems. Not only are the new systems more cost-effective and efficient to operate, they offer a modular approach to transitioning to crops with higher commercial value in centrally irrigated areas that the government, other donors and businesses will be able to easily replicate in other parts of Moldova. In Niger, the agricultural sector employs more than 80 percent of the population and represents the second-largest export sector in the country. Although poverty trends are slowly improving, agricultural productivity has stagnated due to irregular rainfall and a lack of access to equipment, supplies and information. These challenges mean that much of the Nigerien population struggles to support themselves through farming, let alone increase their household incomes. MCC’s $437 million Niger Compact will strengthen Niger’s agricultural sector and has the potential to benefit more than 3.9 million people—including entrepreneurs and small businesses—through investments in a sustainable water supply for livestock and climate-resilient agricultural production, new infrastructure to improve market access, and improved management of natural resources. Agricultural development is critically dependent on sound infrastructure, including transportation networks that provide reliable access between rural and urban areas and food suppliers and consumers. MCC works with partner countries to build and rehabilitate primary, secondary and tertiary roads, as well as other vital infrastructure such as ports, storage and post-harvest facilities, and wholesale and retail markets in support of agricultural economies. 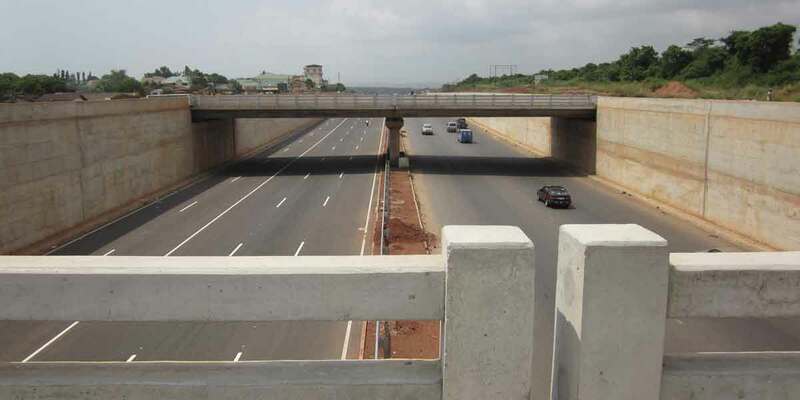 MCC funding upgraded this segment of the N1 highway in Ghana from a two-lane road to a six-lane divided highway with four overpasses, one elevated circle interchange, street lighting, drainage, bus stops, extra-wide sidewalks with ramps, pedestrian walkovers, and stoplights at all major intersections. Ghana’s agriculture sector is the backbone of its economy, yet limited access to food and malnutrition have been major barriers to economic growth and poverty reduction. MCC’s $547 million compact with Ghana aimed to increase the profitability of crops for small-holder farmers and improve and expand commercial agriculture through investments in infrastructure and private sector-led agribusiness development. By compact end, MCC had trained nearly 67,000 farmers in business development and crop productivity, established 10 new agribusiness centers, and rehabilitated 358 kilometers of feeder roads to improve farm-to-market access. With its ability to successfully grow a wide range of tropical and sub-tropical crops, Ghana has the potential to become the leading West African supplier of agricultural products to neighboring countries and Europe, where the demand for tropical, organic and conventional fruits and vegetables is experiencing strong growth. But poor quality and high transportation costs have limited the access and competitiveness of agricultural producers using these roads. MCC’s Ghana Compact included a $221 million transportation project that completed the rehabilitation and construction of new roads, two new ferries, landing stations on Lake Volta, and a new Perishable Cargo Center at Kotoka International Airport to address these challenges. The cargo center is expected to increase export volumes and ensure farm-fresh products and other goods loaded onto daily cargo flights arrive in supermarket shelves in Europe the very next day. Improved nutrition is essential to achieving food security and fostering prosperous, resilient communities. Malnourishment can lead to lower economic productivity, increased health costs, and higher rates of mortality. Undernutrition, particularly during pregnancy for mothers and in the first years of a child’s life, also has extensive health and economic impacts – it can lead to lower levels of educational attainment, productivity and lifetime earnings. MCC’s nutrition interventions complement broader efforts by MCC to strengthen agriculture and food systems and promote economic growth and poverty reduction. Women in Indonesia learn how to properly measure a baby’s height as part of the MCC-funded nutrition project. Currently, more than one-third of children under five years old in Indonesia are chronically malnourished or stunted, as measured by international standards. Consequences of nutritional deprivation during a mother’s pregnancy or in early childhood include higher infant and child mortality from infection and illness, increased susceptibility as an adult to non-communicable diseases, and impaired cognitive abilities, all of which result in long-term economic losses to both individuals and society. As part of MCC’s $600 million Indonesia Compact, a community-based nutrition project aims to reduce and prevent low birth weight, childhood stunting, and malnourishment among children by integrating sanitation, maternal and child health and nutrition interventions. The project partners with the World Bank, using incentives-based community grants to increase demand for health, nutrition and education services. The project improves the health sector’s capacity to respond to this increased demand at the health facility and community levels. The project will benefit children in up to 5,700 villages where the rates of stunting and low birth weight are higher than national averages.